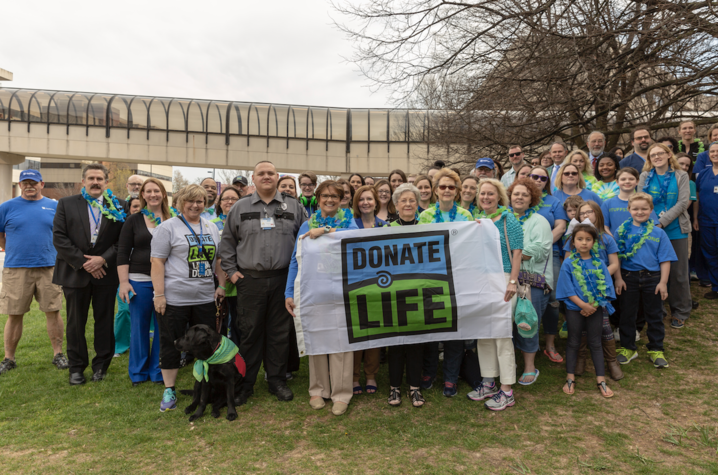 This year's Donate Life Celebration begins Thursday, April 11, 11:30 a.m. in the atrium of UK Chandler Hospital Pavilion A.
LEXINGTON, Ky. (April 8, 2019) – April is National Donate Life month. To honor organ donors and celebrate transplant survivors, UK HealthCare and Kentucky Organ Donor Affiliates (KODA) representatives will host a special reception open to the public this Thursday, April 11, 11:30 a.m. – 1:30 p.m. on the ground floor of UK Chandler Hospital Pavilion A. The program will include short remarks from Dr. Mark Newman, UK executive vice president for health affairs, Dr. Andrew Bernard, UK director of trauma and acute care surgery, representatives of the Marco Shemwell Foundation, and heart transplant recipient David Barber, who will be attending alongside the family of his own organ donor, Matthew Bishop. Attendees are encouraged to show their support by wearing blue and green (Donate Life colors) and signing the Donate Life flag on site. Light refreshments will be served. Currently, more than 110,000 people in the U.S. and nearly 1,000 Kentuckians are on the transplant waiting list. Approximately 8,000 people die every year – almost one person each hour – because the organs they need are not donated in time. One individual donor can save up to eight lives and help heal up to 50 people through organ and tissue donation. Although hospitals are obligated by law to identify potential donors and allow the organ donor procurement program to inform families of their right to donate, anyone can sign up to become an organ donor by joining the Kentucky Organ Donor Registry. The registry is a safe and secure electronic database where a person’s wishes regarding donation will be carried out as requested. To join the registry, visit registerme.org or sign up when you renew your driver’s license. The donor registry enables family members to know that you chose to save and enhance lives through donation. Kentucky’s “First Person Consent” laws mean that the wishes of an individual on the registry will be carried out as requested. UK HealthCare and KODA celebrating Donate Life Month's National Blue and Green Day 2018.